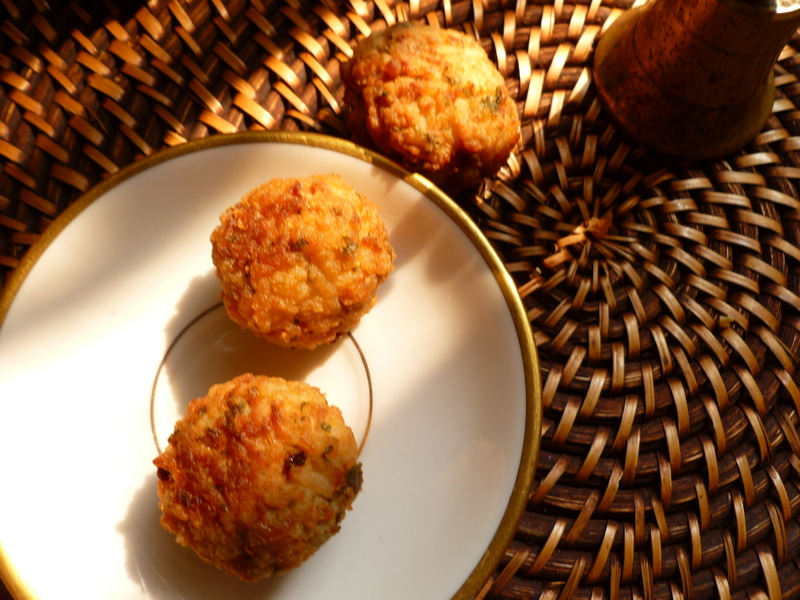 These little rice balls are warm and chewy and salty and altogether nice. They are included as an hors d’oeuvre in the menu for A little Italian lunch. Mix the rice and water and simmer gently until the water is evaporated. Flour your hands and form the mixture into small balls (about golf-ball size). Arrange these on a plate or baking pan and heat about 1-inch of peanut oil in a heavy-bottomed pan or casserole. Shallow fry the rice balls, 5 or 6 at a time, turning them occasionally so that they brown evenly. Take your time. These don’t require any tricky deep-frying techniques in order to turn out well. If you are making these right before your guests arrive, drain them and arrange them on a baking sheet to be briefly reheated before serving. Serve them sprinkled with salt garnished with some more chopped parsley, or a branch of some other fresh herb. A bowl of oily black olives is nice alongside them, too. You can make these a day ahead and reheat them right before serving. They crisp up and taste as though they were freshly made.